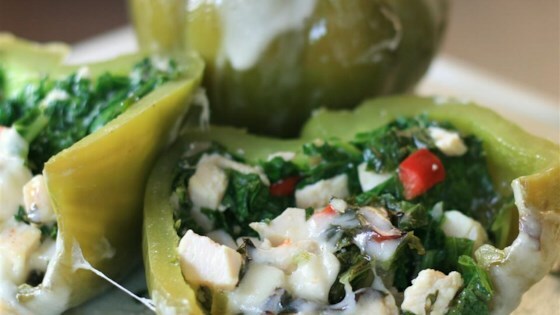 "Stuffed peppers that even the kids will enjoy! Super tasty and easy to make!" Heat oil in a small skillet over medium-high heat. Saute pepper and onion mix in hot oil until the onions are translucent, 7 to 10 minutes. Mix sauteed pepper and onion mix, chicken, kale, goat cheese, garlic powder, cayenne pepper, and salt together in a bowl; spoon into bell peppers to overflowing. Arrange stuffed peppers in a casserole dish. Brush coconut oil on outside of peppers, if desired. Bake peppers in preheated oven until soft, 30 to 40 minutes. Top each pepper with a half-slice of cheese and continue cooking until cheese melts, about 5 minutes.